This is one of Andy Esquivel’s first slight-of-hand fake product videos and it’s hilarious! Andy begins by showing you a Samsung Instinct box then flips it over to reveal (dramatic pause0 a silver Xtagged sticker! Having a sticker on a box obviously means it’s a bundled product, right? he goes on to explain that Xtagged is now shipping with the Samsung Instinct phone from Sprint and begins showing you how it works. 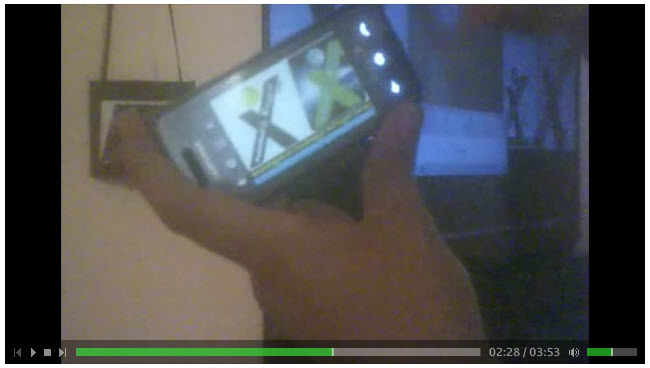 With a magical mix of photos stored in his phone and a savvy flip over to the built in web browser, Andy tries to convince the viewer that all he has to do it point the phone at someone’s Xtagged badge and the phone’s “secret formula freezes the shot and automatically takes you to” the persons Xtagged profile. Only a complete idiot (like Allen Brady) would fall for this pathetically transparent trick, but Andy seems excited about it nonetheless. It takes either someone who is completely insane or really high to believe that anyone out there would fall for this sort of thing, but Andy does. He even goes on to explain that ‘recruiters’ can use the technology to stop ‘pedophiles’ from posing as something. i dind’t quite understand that part of the pitch, but Andy is excited about it anyway. I love how he say’hes lawyers finally gave him the thumbs up to release it to the public. I even called Samsung to see if this phone existed with the Xtagged technology and they never heard of it. Yet Ron and Allen still believe….Lol.